April 09, 2019 at 2:13 am. Chris Davis stands alone in terms of baseball offensive futility. 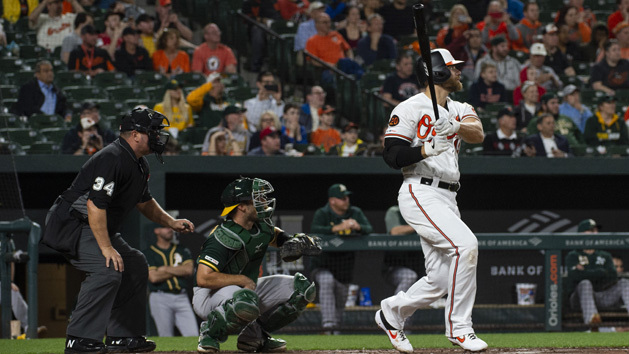 The Baltimore Orioles first baseman went 0-for-5 on Monday against the visiting Oakland A’s, leaving him hitless in his past 49 at-bats, dating to last year. That is a major league record for a position player, passing the mark of 0-for-46 set by Eugenio Velez in 2010-11. Davis lined out to right in the second inning, lined out to left in the third, then lined out to left in the fifth to pass Velez. He struck out looking in the seventh and fanned swinging in the eighth to leave him 0-for-28 on the season. He entered the night having struck out 13 times and walked four times in 27 plate appearances this year. Davis has a $23 million salary this year, and he is guaranteed the same amount in 2020, 2021 and 2022, with $17 million to be paid annually and $6 million to be deferred without interest. He re-signed with Baltimore as a free agent in January 2016, landing a seven-year, $161 million deal after he averaged 42 homers and 109 RBIs over the previous three seasons.